Classified as the most flexible joint in the human body, the shoulder is formed where the humerus (upper arm bone) fits into the glenoid of the scapula (shoulder blade), forming a ball and socket joint. 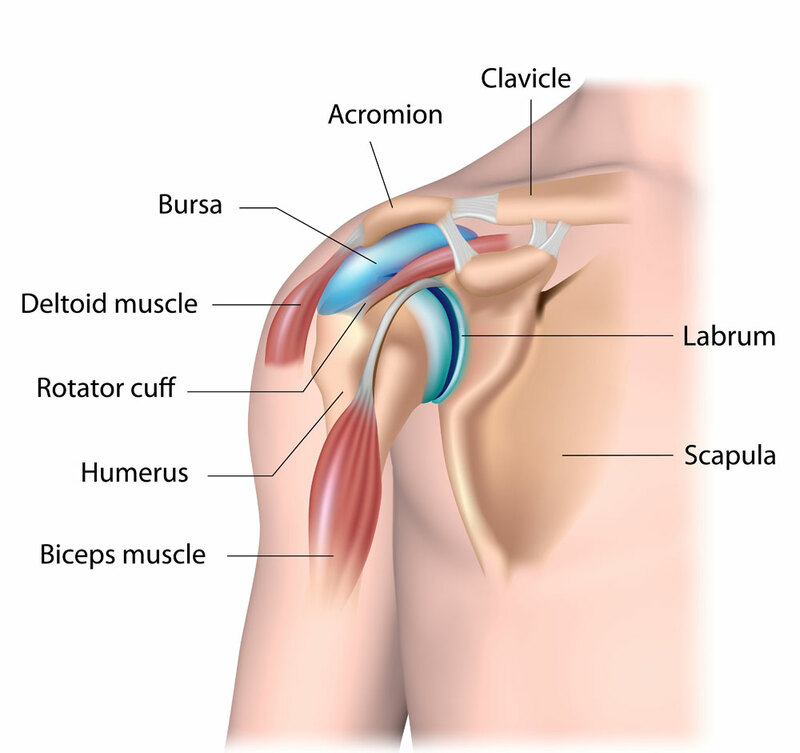 Other important structures are involved in shoulder motion and function, including acromioclavicular and scapulothoracic joints within the shoulder, cartilage, ligaments, tendons and muscles. All of these structures work in unison to provide a wide range of motion and allow individuals to participate in athletic activities, perform work movements and enjoy everyday activities. Located in the Van Nuys, Thousand Oaks and Los Angeles, California communities, Dr. Mark Getelman, shoulder specialist, specializes in disorders of the shoulder with expert understanding of the anatomy of the shoulder and strives to return patients to an active, healthy lifestyle following a shoulder injury. The scapula extends up and around the shoulder at the rear to form a roof, known as the acromion, and around the shoulder joint at the front to form the coracoid process. The end of the scapula, known as the glenoid, meets the head of the humerus to form the glenohumeral joint. Acromioclavicular (AC) joint: This joint provides a lifting ability and is located at the top of the shoulder. Sternoclavicular (SC) joint: This joint allows movement of the clavicle and is located at the center of the chest. Glenohumeral joint: This joint allows the arm to move up and down, in and out and to rotate and is created by the union of the humerus and scapula. Articular cartilage: Located in the joint cavity, this smooth, white tissue covers the ends of the bones and provides a pain-free gliding surface for the bones. Labrum: The labrum is a ring of fibrous cartilage surrounding the end of the scapula (glenoid) and is responsible for stabilizing the shoulder joint. Rotator cuff: Providing support and range of motion to the shoulder joint, the rotator cuff is a collection of 4 muscles and tendons that provide dynamic stability to the shoulder. A number of ligaments connect the bones of the shoulder, and numerous tendons attach the bones to muscles within the joints. All of these structures making up the anatomy of the shoulder work together to allow shoulder movement and function, and provide stability for the arm. For additional resources on shoulder anatomy, please contact the Van Nuys, Thousand Oaks or Los Angeles, California orthopedic office of shoulder specialist Dr. Mark Getelman.